I am sure many of us are too much dependent on Internet Download Manager a.k.a. IDM. The main reason didn’t permanently switch to linux was IDM. I mainly use it for batch downloading and download streaming videos. Till yesterday, IDM was working fine with me (of course with fake serial numbers, keygen, crack, patch etc. which could be found with little effort). I tried re-patching, reinstalling, but this annoying message was persistent. It was so annoying that it keeps popping up until you exit IDM. Many of the users were experiencing the same problem and the most favorite solution was to edit the “c:\windows\system32\drivers\etc\hosts”file and setting the address of http://internetdownloadmanager.com and similar domains to local host 127.0.0.1 [click to see]. The other way is the easiest way. After cracking and patching IDM, just go to the installation folder of IDM “C:\Program Files (x86)\Internet Download Manager” and rename the “IDMGrHlp.exe” to anything you want or just delete it. Done! But wait! Every time you run IDM, there would be a new popup box saying “IDM cannot find 1 files that are necessary for browser and system integration. Please reinstall IDM“. To get rid of it, place anything in that folder “C:\Program Files (x86)\Internet Download Manager“ and rename it “IDMGrHlp.exe“. I made a copy of the “idmBroker.exe” and renamed it to “IDMGrHlp.exe“. 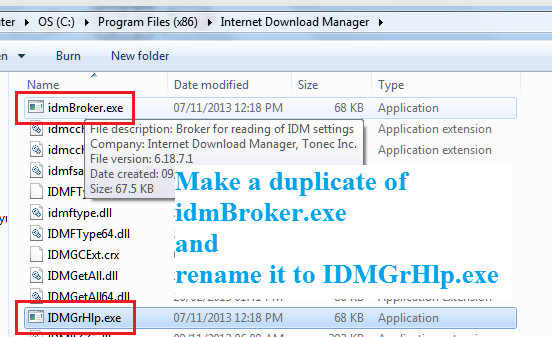 Make a duplicate of idmBroker.exe and rename it to IDMGrHlp.exe.